We are providing our precious patrons a precision-engineered Double Cone Blender. Known for its anti-corrosive properties, it has fetched high demands in the market. Offered blenders are ideal to be used for the purpose of mixing dry powder and granules homogeneously. To ensure the same, we manufacture the parts of these cone blenders using stainless steel, sourced from the most eminent vendors of the industry. 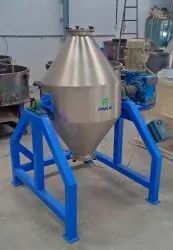 It is used for blending agrochemicals, breakfast cereals, ceramic powder, metal powders and plastic granules etc.